Saudi Arabian Prince Alwaleed bin Talal as of Febuary, 2010 owned a 7 percent stake in Rupert Murdoch's Fox News Channel, making him the company's largest shareholder outside of Murdoch's own family. In the 1995 publication "The Rise, Corruption and Coming Fall of the House of Saud", Said K. Aburish claimed that the Saudi prince has invested billions of dollars in the Disney Corporation (owner of ABC News) and Time Warner (owner of CNN). His other holdings reportedly include investments in Coca-Cola Company, McDonald's, Ford Motor Company, Amazon.com, eBay, and Internet Capital Group. Alwaleed is best known for going to Ground Zero after the 9/11 World Trade Center attacks and personally handing then-mayor Rudolph Giuliani a check for $10 million to help finance relief efforts. Afterwards, Alwaleed released a statement blaming the attacks not on the Saudi airline hijackers, but on U.S. policies in the middle east. As a result, Giuliani returned the prince's donation, gaining him praise from Fox News for doing so. Now that Alwaleed has a controlling ownership in News Corp., he is gaining influence over Fox News. In 2005, just months after Alwaleed acquired his first 5.4 percent stake in News Corp., Fox News covered riots in Paris under a banner saying "Muslim riots." Alwaleed allegedly called Murdoch and had him change the banner to say"Civil riots." Investigative journalist Joseph Trento also reported that a comment he recently made on a Fox Network morning news show, Fox and Friends, about Saudi Arabian money still financing Al Qaeda, was edited out of the show. Trento also reports that Alwaleed "has personally donated huge amounts of money to the families of Palestinian suicide bombers." In a rare interview with Fox News' Neil Cavuto in January, AlWaleed explained his personal reasons for seeking influence in American politics: the U.S. buys Saudi Arabia's oil, and the bulk of his country's gross domestic product (GDP) comes from oil. Fox News reliably broadcasts misinformation on clean energy, and aggressively fights efforts to move America away from being dependent on a fossil fuels. Al-Waleed bin Talal in the Wikipedia. Time/CNN presents Global Influentials 2001: Prince al-Waleed, Global Investor. Jon Swartz, "Big Buys By Saudi Prince. He invests in Netscape, News Corp., Motorola," San Francisco Chronicle, November 26, 1997. Iqbal Latif, "What money can't buy. Saudi prince snubbed by New York," The Iranian, October 24, 2001. Joseph Farah, "Prince Al Waleed Bin Talal and the Media," World Net Daily (United States Committee for a Free Lebanon), November 7, 2001. "Al Waleed Buys MTV," Naharnet, September 28, 2002. "Al-Waleed Bin Talal Clashes in a Shootout with Walid Jumblat," Naharnet, April 13, 2003: "Saudi Arabia's royal business tycoon Prince Al-Waleed has unleashed his ire against Druze leader Walid Jumblat, who has accused the kingdom of opening its soil to U.S. forces and supporting Washington's policy, while encouraging Islamic fundamentalist fever." 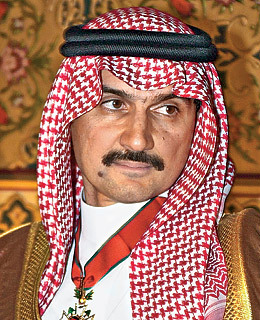 "Prince Al Waleed bin Talal buys 5% of Kuwait invest holding company," Strategiy.com, December 26, 2004. "Saudi Prince Al Waleed bin Talal hoster of telethons for suicide bomber families buys large share of Fox News. Saudi prince advocates strategy of business not boycotts to 'influence American public opinion'," Militant Islam Monitor.org, September 25, 2005. This page was last edited on 27 November 2011, at 20:53.